At the tip of the island looking across the St. Lawrence to New York State, the Islander stands stately and luxurious. Take a ferry from Kingston and follow the twisting island 2-lane to the very end. Enter to beauty and comfort: a great room overlooking the river, new beds and attractive duvets, a dining table that can seat 10 and a open kitchen with all facilities. Outside the grassy shore yard is landscaped with a limestone barrier and accents. With a 1200 square foot stamped concrete dock. it is 100' long with a 30' "L" at the end, boat launch at private dock. Explore the 1000 Islands – you will want to bring your boat. Perfect for young children – walk out on sand bottom, shallow water. Treat yourself to the Islander at any time of year. NO WEEKEND RENTALS DURING THE MONTHS OF JULY AND AUGUST. Featuring catherdral ceiling and chalet style post and beam with a grand floor to ceiling 30 foot wood burning fireplace, in-floor heating thoughout and 300 feet of waterfront contained by a limestone retaining wall. Enjoy the east morning sun from the walkout basement to the outdoor living space with a wood burning fireplace and man-made waterfall or relax in the sunken hot tub located in the spacous deck and watch the spectacular sunset over the cove on the west side of the property. Baste in the amble sunshine and watch the ships cruise by or enjoy the sand bottom cove where you can launch your boat off the boat launch and enjoy the St Lawrence and all the 1000 islands have to offer. 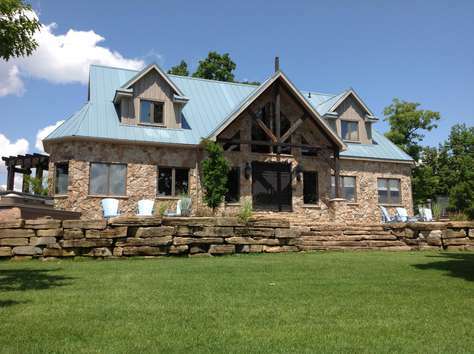 This waterfront property is ideal for swimming, boating and fishing. 1500 square foot dock finished with stamped concrete with a bar hut located on it. Also enjoy the theatre room with 100" drop down screen with surround sound. Also enjoy the bowflex gym. The cottage offers phenomemal views of the St. Lawrence from the multiple large windows thoughout and children have access to their own 4th level loft. The Wolfe Island Lodge is available year round and every season has something unique to offer from seasonal sports to year round ample wildlife. BOOK THIS LOVELY COTTAGE TODAY! 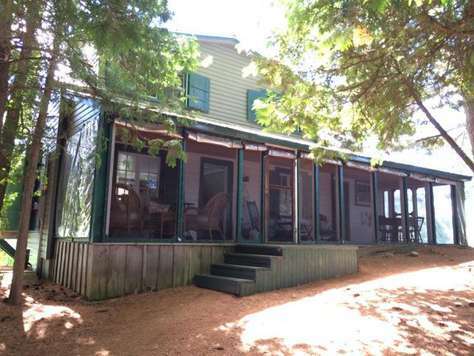 Less than a 5 minute boat ride from the mainland, the entrance to the cottage is a welcoming 33 foot screened in veranda which is used for relaxation and dining. The living room features French windows that overlook the lake and a cozy wood-burning stove. The fully equipped kitchen offers windows on three sides, a dishwasher and a microwave. There is a colour TV but only works with the DVD/VCR player. There is a bedroom on the main floor with a double bed and a galley laundry area, as well. Upstairs there are two bedrooms, one with a charming 3/4 spool bed and the other with 2 twin beds. The full bath is also on the 2nd floor and is complete with an antique washstand, vessel sink and stand up shower. There is also an upstairs sleeping porch which is perfect for reading or taking a nap. Outside is a screened in gazebo with a comfortable hammock and lakeviews all around. The restored cedar lined boathouse has 2 narrow slips that will accommodate a craft up to 17' in one slip and a 12'-14' craft in the other. There are two kayaks, a fire pit and a BBQ on the island. Activities include excellent fishing, swimming and boating. You can see many fish off the dock. Located near the towns of Newboro and Westport, Lottie's Isle is close to restaurants, shopping, golf, historic tours and horseback riding. The cottage is conveniently located not far off Hwy 15, about halfway between Toronto and Montreal, 40 minutes from the Canadian/US border and 1 hour and 25 minutes from Ottawa.